Here’s the post I think everyone has been waiting for lollll. After visiting with my sister in London, I flew to the Nice airport to meet up with Carling and Olga so that we could make our way St Tropez together (word to the wise, it is not the easiest place to get to!). For all of the trips I have been on, I have never before received so many DMs requesting a travel post or recommendations for St Tropez. So by popular demand, here it is! First things first: about 4 years ago, I actually visited St Tropez on a day trip. You can read my underwhelmed impression of it here. This, my friends, is why everything deserves a second chance! I absolutely adored St Tropez this time around. 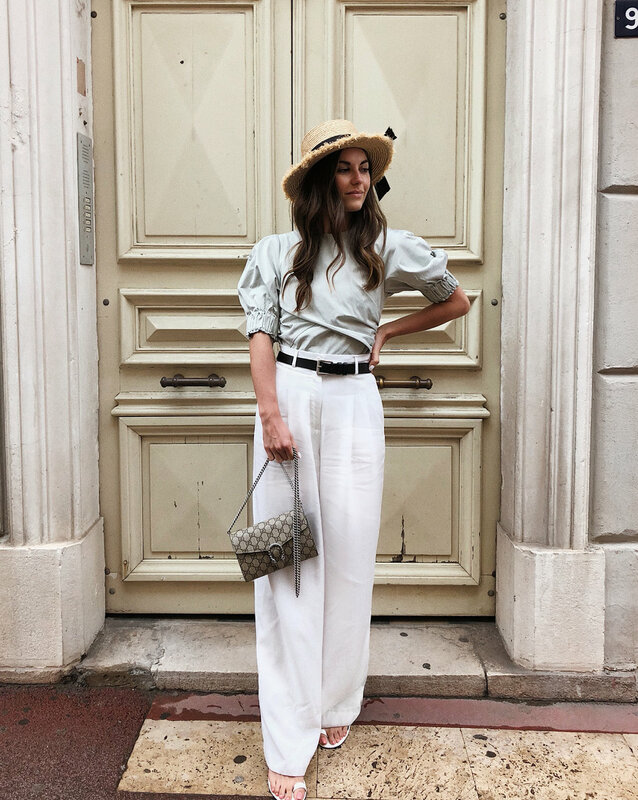 The primary difference was the fact that we actually stayed in the famed French Riviera town for a few nights, so we really got to experience all it had to offer. When I was there back in 2014, we didn’t really have much of a plan aside from wandering around, so unfortunately we ended up in some more touristy spots. We also didn’t have enough time to visit any of the beaches or beach clubs, which is half the reason why St Tropez is as renowned as it is. Finally, the vibe of this small town changes so much from day to evening… during the daytime, the streets are filled with cruise-ship passengers and other visitors coming through on day trips. By early evening, the golden hour sets in and the day-trippers and cruise-ship passengers leave. It is sooo beautiful and calm, and the streets are so quiet and perfect to walk around in. GETTING THERE: As I mentioned above, St Tropez is as exclusive and special as it is partly due to how difficult it is to get there. You have very few options if you don’t have your own private yacht that will take you straight into the port. During high season (June-August, check schedules in advance! ), there are ferries that operate along the coastline from more major towns along the French Riviera, such as Nice. We ended up going in mid-May, so ferries were not running yet. Our only option, aside from renting a car, was to roll up in style on the bus. Affordable and actually super convenient! We all flew into Nice and caught the bus straight from the airport. We did have to transfer once in St Maxime, but the bus schedules all run in conjunction with each other so transferring was easy and well timed. In total I think it cost us around 20 Euro each and took about 2.5 hours. When we left, we flew out of Toulon Hyères airport, a much smaller airport that I believe only services France (we were flying to Paris). Again, we took the bus after weighing our options (rental car or Uber would have cost us over 100 Euro, one way on the bus was 3 Euro LOL). This bus ride took 1.5 hours. 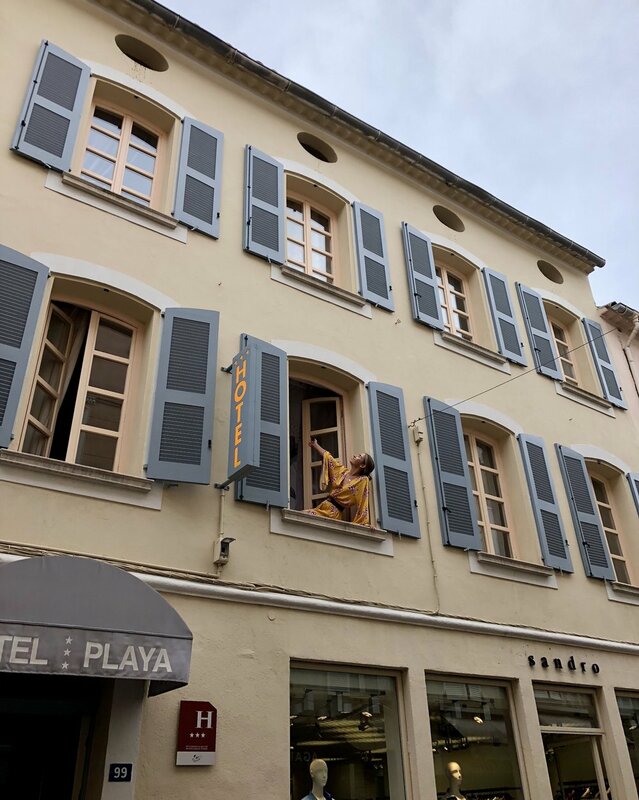 STAYING: To fully experience St Tropez, I highly recommend staying in the town or surrounding area instead of doing it as a day trip. 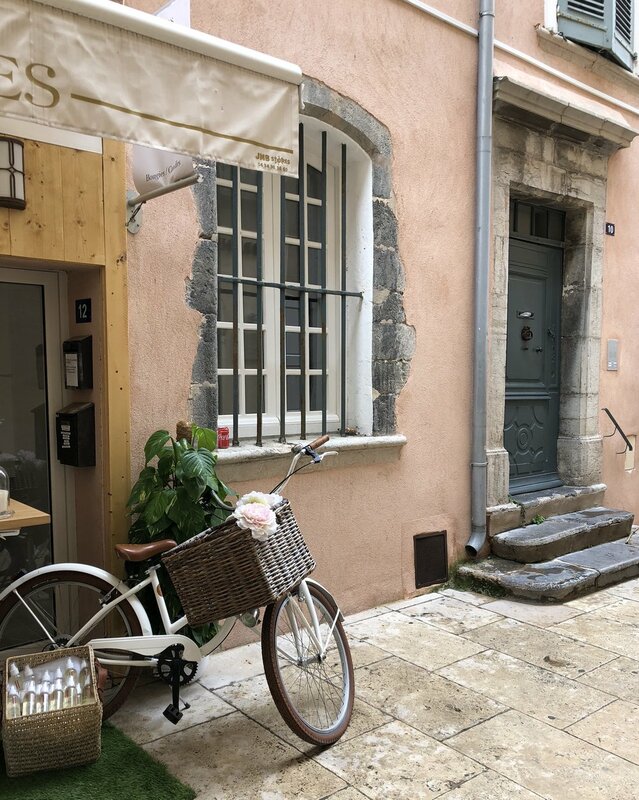 There are plenty of luxury options for accommodations of course, but if you’re on a bit more of a budget like we were, there are some cute little Airbnbs to choose from that are cheaper. We ended up staying at Hotel Playa, a small and very affordable hotel in the town. With it not yet being “high season”, we paid around 90 Euro/night per room. The hotel was ridiculously well located and central, and the staff were also very kind and helpful. 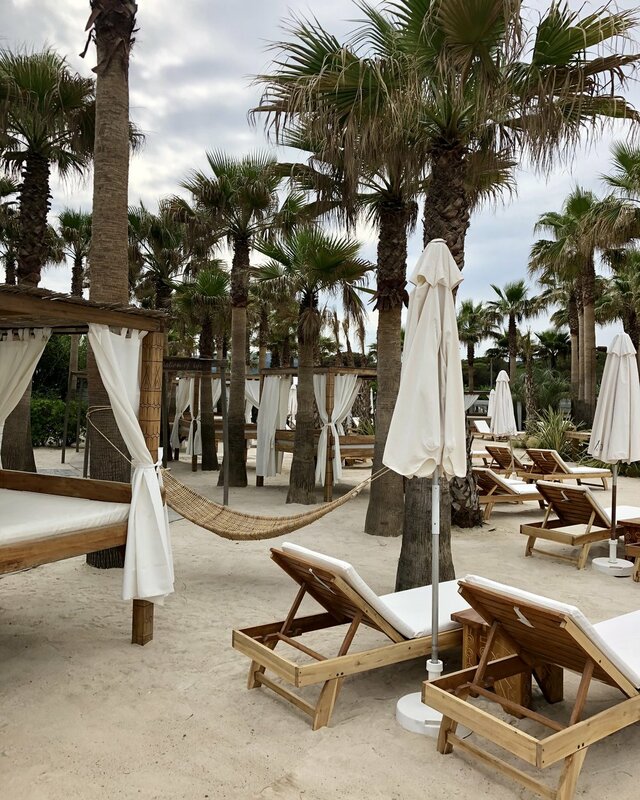 -Nikki Beach – where we decided to spend our afternoon. This place is a dream. It’s not actually situated on the main beach, but has a huge pool and tons of lounging areas, hammocks, booths, seats around the pool, etc. It’s surrounded by palm trees and greenery, with bohemian touches throughout. It’s just heavenly. 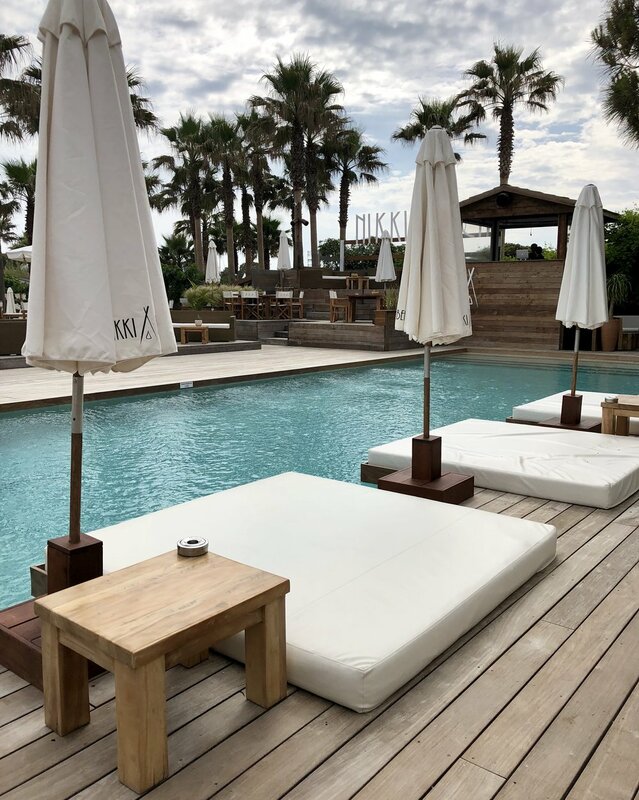 -Le Club 55 – most famous beach club in St Tropez. This is where everyone goes, and it’s obvious why! It’s an oasis right on the beach, with a funky beach-chic restaurant set a bit further back from the beach. Chairs and resos need be booked far in advance during high season. -Plage Des Graniers – if you don’t want to venture all the way to Pampelonne Beach, this is a little tucked away sliver of beach about a 15 minute walk from the centre of St Tropez town. It has soft golden sand and a super cute bohemian beach bar where we drank Aperol spritzes and watched the sun set. It had more of a “locals-only” feel, but maybe that was just due to the time of year we went. 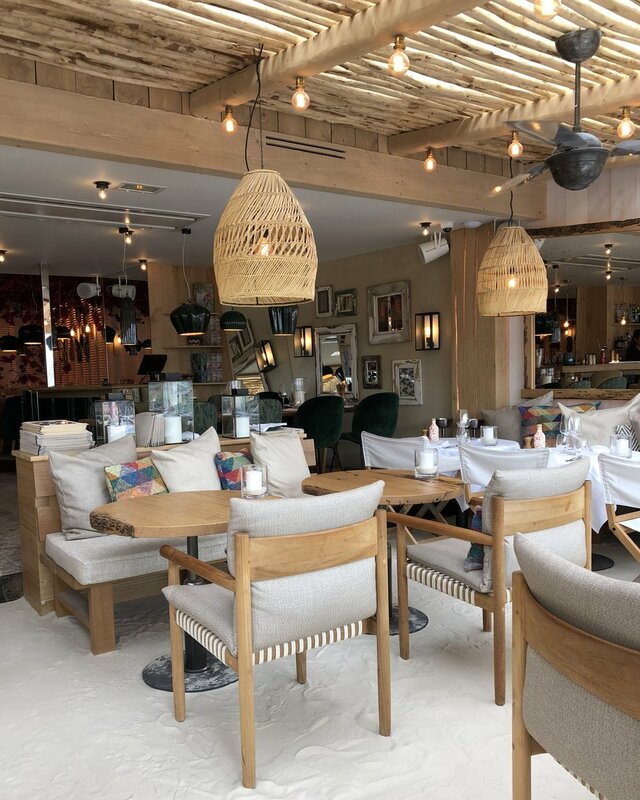 -L’Olive – hands down best local spot in St Tropez. Sooo affordable, with some of the best food I have had. In our 3 days in St Tropez, we came here twice for dinner because it was THAT good and the prices were so reasonable. Every single dish was amazing. Try the truffle mushroom ravioli, lasagna, caprese salad, and seafood pasta. -Le Petit Plage – all along the port are many touristy cafes and restaurants. We avoided this area for the most part, but when a few locals recommended Le Petit Plage to us for dinner, we gave it a try. The vibe in here is so fun, with hanging wicker basket lights, white wood furniture, bougainvillea, sandy floors, candles, and colourful cushions and wall hangings. It was absolutely packed so we waited at the bar with wine until our table was available. Amazing food. We had fries, meatballs, mussels, and a burger…. The burger is honestly an EXPERIENCE. It comes under a glass dome with smoke. Once the whole presentation production is over, it’s also the best effing burger you’ll ever eat. -Dior Des Lices – go for the pics/photo opps, because this café is absolutely stunning and so over the top. Of course it is extremely pricy as well. Reservations are required, which we didn’t know about. We ended up getting lucky and snagging a little spot on some couches to drink our cappuccinos. Unfortunately the staff were a bit unpleasant. -L’Opera – spent a blurry evening dancing and ordering multiple bottles of rose at this super lively and fun club on the waterfront. Got ourselves a bottle of Whispering Angel, think any of us were sober enough to enjoy it? OF COURSE NOT! -Since everything is pricier in St Tropez, we opted to save on some meals when we could, and hit up the grocery store to grab cheeses, baguettes, croissants, veggies, and dips to take on seaside picnics for a few breakfasts/lunches. SHOPPING: The shopping is amazing in St Tropez, and every major designer and many beloved French brands all have stunning boutiques in the town. -Chanel – really more of a mansion… a huge house with a back garden, pool, and pool house (which has more Chanel product in it). Pictures aren’t allowed, but we tried to sneak a few anyway. -Hermes – can’t miss it… regal-looking boutique right near the main port area. -Dior – again, more of a mansion than a store, and the Dior-des-Lices café is out front and super bougie.